I always wanted to do something creative with my hands, so when I wanted to change my career I looked at many crafts. 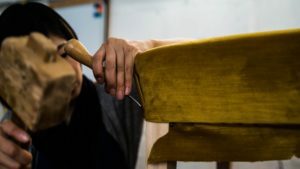 To cut a long story short, after trying a part time course, I knew I wanted to learn more as I enjoyed every step of the process of upholstery. In the beginning I didn’t have an end goal, I just wanted to learn more about upholstery, gain skills and see where that led me. 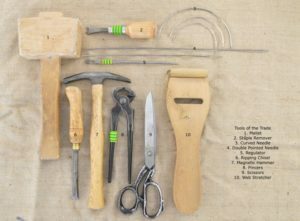 I chose Oxford School of Upholstery because I wanted to learn full time, Monday to Friday, non-stop. I liked the immersive approach but also I liked that I could enrol anytime of the year and the flexibility. However, most of all, I had a very good feeling about them from Rachel’s reply to my enquiry which I had sent from Japan. I came a long way from Japan and although I’d had good communication with Rachel I didn’t really know what to expect but everyone was really friendly, very helpful and there was always a good spirit in the workshop. 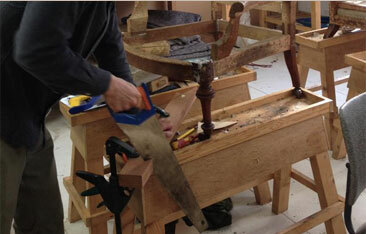 I loved being there and I was absolutely hooked by upholstery, the atmosphere of the school, the people I came across. That’s why I kept coming back to learn! I found it very unique, creative and international environment. Not to mention there were people from all over the UK, there were also students from Africa, from France, Thailand and I was the student from the furthest but soon there was someone from Canada, America and Australia as well!! The quality of the teaching was very good, I learned so much. Especially I learned from skilled, experienced upholsterers. Each of them had their different skills & techniques which I could obtain. 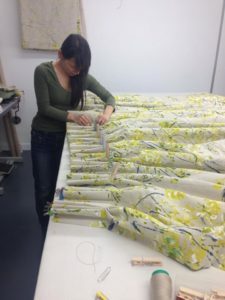 I learnt traditional/modern, English/French upholstery techniques, as well as a life time experience but I didn’t stop with upholstery I also learned how to make hand sewn and drum lampshades soft furnishings and curtaining there. 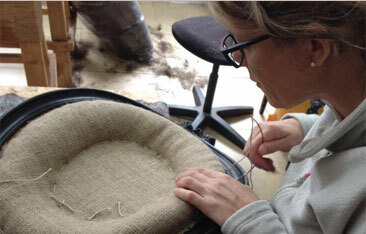 As I learned more about upholstery I gained confidence and my ambitions grew. All chairs and sofas are different. There’s always something new to learn. I just wanted to learn more and more and I really wished I could work for the company. My dream came true! I joined the workshop as a team member in 2012 and worked with them for about 4 years gaining experience.